Discover the History of Christmas Trees, the meaning and origin of this tradition, from Martin Luther to Rockefeller Plaza. This icon of Christmas brings joy and the spirit to nearly each and every of the millions and millions of homes that celebrate Christmas each year. The History of Christmas Trees as a decoration tradition may have begun as far back as the 7th century when it is said that a monk named Devonshire spent time in a part of Germany we now regard as the birthplace of many modern Christmas traditions (such as Christmas Markets). He used it as a symbol to denote the Christian trinity. In 16th-century Germany fir trees were decorated, both indoors and out, with apples, roses, gilded candies, and colored paper. In the Middle Ages, a popular religious play depicted the story of Adam and Eve’s expulsion from the Garden of Eden. A fir tree hung with apples was used to symbolize the Garden of Eden — the Paradise Tree. 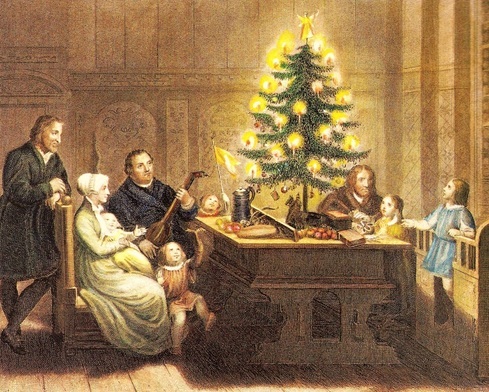 The play ended with the prophecy of a saviour coming, and so was often performed during the Advent season, which added to the History of Christmas Trees being used to denote Christian a celebration. It is held that Protestant reformer Martin Luther first adorned trees with light. While coming home one December evening, the beauty of the stars shining through the branches of a fir inspired him to recreate the effect by placing candles on the branches of a small fir tree inside his home. In the mid 1600s, German towns saw Christmas markets flourish within its confines. These Christmas Markets showcased gifts, food items, and various holiday treats. These holiday treats were usually bought by people to use such items as decorations for their Christmas trees. A tradition that continues today around the world. The Christmas Tree was brought to England by Queen Victoria’s husband, Prince Albert from his native Germany. The famous Illustrated News etching in 1848, featuring the Royal Family with Victoria, Albert and their children gathered around a Christmas tree in Windsor Castle, popularized the tree throughout Victorian England. 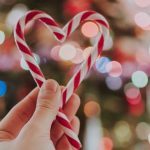 Christmas Traditions during the Victorian period remain a major influence on modern celebrations, including the History of Christmas Trees, and decorations of the time. 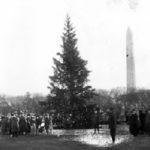 German and British immigrants to America brought their Christmas Tree Traditions along with them. In fact, when Christmas Trees were becoming popular in the United States, most often they were artificial trees made from Goose Feathers, died green. Otherwise, the may also have chosen a wood-based, or later in the 1930s, a plastic bristle-based tree. However, real trees soon took over as the preferred decoration, and by the late 19th century they were commonplace along the east-coast. 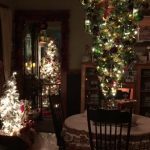 Through the world wars, and beyond, Christmas Trees have endured as a family tradition for most who celebrate Christmas. 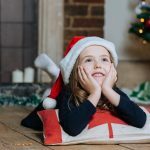 The most impactful decades for Christmas Tree nostalgia of the 20th century will likely remain the 1950s and 1960s, when Baby Boomers were celebrating their childhood Christmases. Modern Vintage decorations are a peak holiday theme, not just for Christmas Tree decorating. Today, there are as many different Christmas tree decorating styles as there are personalities! Even different countries use different decorations and traditions. For more on this topic, see our section on Christmas Tree Decorations.